Gluten-free matzo ball soup is a delicious, homemade chicken soup made with fresh stock, loaded with fresh vegetables, and studded with homemade gluten-free matzo balls. This comfort food in a bowl is perfect for rainy days, when you're feeling under the weather, or just need to curl up to something warm, filling and cozy. You can make your own gluten-free oat matzoh crackers to prepare the gluten-free matzo meal which is the key ingredient in gluten-free matzo balls. If you prefer, you also can purchase gluten-free matzo meal or crackers to use in this recipe. 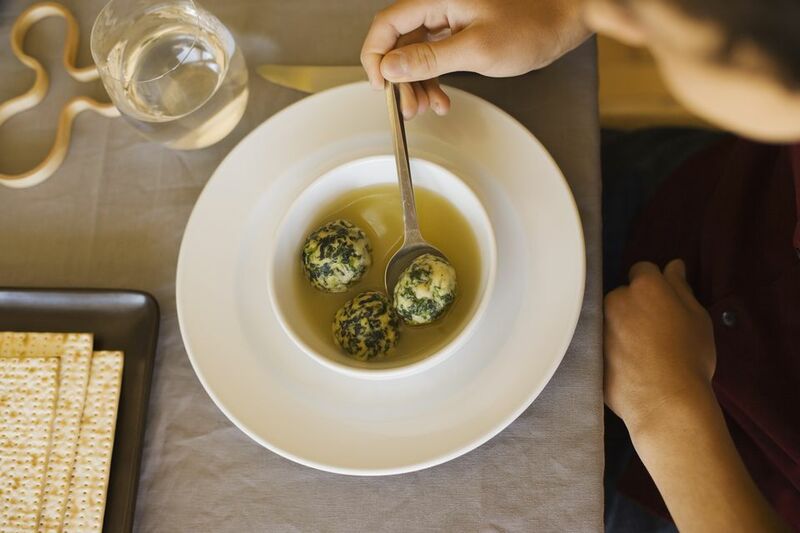 Once you prepare the gluten-free matzo balls, simply simmer in fresh chicken stock for 30 minutes to bring all of the flavors together into a delicious, comforting soup. Make one recipe of homemade chicken broth and one recipe of gluten-free oat matzo crackers. For convenience, both recipes can be made up to 2 days before serving your matzo ball soup. Separate egg whites and yolks. Place egg whites in a mixing bowl and whip until stiff peaks form. In a separate bowl, whisk egg yolks, chicken stock, and olive oil. Place gluten-free oat matzo crackers in a plastic bag and use a rolling pin to crush to fine crumbs. For finer crumbs, place crushed crackers in a clean coffee bean grinder and pulse 2 times. Add salt and pepper to crushed matzo cracker crumbs and stir to combine. Use a large spatula to gently fold half of the cracker crumb mixture into the egg whites. Next, gently fold half of the egg yolk mixture into the egg white-cracker crumb mixture. Repeat with remaining cracker crumbs and egg yolk mixture. For easy, round matzo balls, use a 1/8 cup-capacity ice cream scoop to form balls or form matzo balls using a rounded heaping tablespoon of matzo dough. Drop matzo balls into simmering chicken soup and cover with a tight-fitting lid. Simmer for 30 minutes and don't lift the lid to peak! Crush one to one and a half 8-inch gluten-free matzo crackers to make matzo meal. Always make sure your work surfaces, utensils, pans and tools are free of gluten. Always read product labels. Manufacturers can change product formulations without notice. When in doubt, do not buy or use a product before contacting the manufacturer for verification that the product is free of gluten.